The Xperia X10 root became publically available yesterday and there are already a number of people who are having difficulties in successfully rooting their device. However, don’t fear, help is at hand from Youtube member gne0n. He has produced a 10 minute video that goes through the full rooting procedure. Use it as a supplement to the original instructions to hopefully get your Xperia X10 rooted. Check out the video after the jump. How do you set the java environment on Windows &. Searched the string and cant find the answer? What is good with rooting? someone please explain and is there any defects? If you root it, one thing it enables is paid android apps. Most of the world are limited to the free ones as Android Market only sells apps to the US, UK and a few others. People in e.g. Scandinavia need to root their device to be allowed to add a Google Checkout account. With root you can also install / change a lot of settings that is hidden / blocked. Nice, finally.. has anyone tried it yet??? any success??? Can I root my phone when using a Mac? I see everyone using a PC!!! Thanks! Hey. ive been traying this but i keep getting an error saying…. please connect Xperia in flash mode. If you can’t find your Device ID, then you have to run SEUS (Sony Ericsson Update Service) PC Companion and try to update your firmware. You don’t actually have to update, but you have to get to the point where you have to power off, take out the battery for 5 seconds, put it back in, and insert the USB cable while holding down the Back button (don’t worry, it tells you exactly how to do everything). This puts it into flash mode, and SEUS/PC Companion will install the device driver. I think this is where it tells you that you have the latest software, so you can just quit. The Device ID should then be in your registry. The app is called Beautiful Widgets. Hi, Thanks for the nice Job. Can you clarify my doubts on rooting. 3. I use TS and MS frequently, is there a way to get them both after rooting. Or when SE releases the firmware update they promised that is “imminent”, will I be able to update to it through “Update service” without losing root? This would awesome for me. I’m new to rooting, which explains these noob questions. I’ll wait for your answers before starting the root. New video guide for who have the java issue. Wow….. Thanks for the video, rooted my phone last night!!! I noticed someone else has had the same probs as me with the java enviromental settings, found the below on youtube. Oh yeah, the cable was pulled out half way through the first flash, i thought i had bricked the phone, but amazingly i reflashed it and all seems good. Its nice to have a bit of luck with you sometimes. got a little problem, can’t find “device instance” in registry and phone won’t be recog in SEUS PC companion. I’m on Win7 Starter edition, is anybody facing the same trouble? Any other cooler apps or uses for the rooted x10??? I root my phone on monday and now I am having a few problems with it. The question is “how can i un-root the handset to install the orginal SE software”? i actually want to root my xperia x10 but what benefits i can get in rooting my x10? does rooting x10 will google android market will appear? and also the mediascape and timescape will be kept? I must say help is needed. I followed the video and successfully got my X10 rooted. Unfortunately, when I re-installed the mediascape lost due to the process, my X10 can no longer be turned on! Every time when I turn it on, it shows only black screen with backlight on. I must take the battery out to turn it off. I repeated several times, but still failed. I wanna root it once again, or at least, recover it. But still, device not found. I couldn’t enter recovery mode, nor flash mode. I followed this post to re-install my mediascape. Hope anyone here can give me a pity coz it affects me a lot. Hey! I just added some videos (mpeg format) from my ps3 to my xperia x10. Ive tried doing this, dont have any problems until i enter flash mode and hit enter on my PC… at that point, the program tells me it cant run on a 64bit machine. Is there an alternative program for 64bit use? Or am i doing something wrong? Or am i just screwed on getting my x10 rooted? Wad should I prefer rooting or the Sony update.. I want a faster phone as well as the 2.1 OS… Would Rooting stop my updates? Can anyone tell me the real advantages of rooting? So I rooted my xperia X10 as you showed it in the video, success!!! Thanks, but this is not Android 2.1 yet. It still shows that it is Android 1.6. Does it mean that I have to find now a original 2.1 firmware? I’ve completed the first step, waited till the end of the scroll, removed the battery and on again, until appears DOCOMO screen. After that the phone remains with black screen and does not activate. I’ve repeated the step one several times but always getting stuck with a black screen and not functioning phone. Can you help me ? Hi Silva, I had the same problem you had, did you get to sort it out? how to path java enviromental variable .? 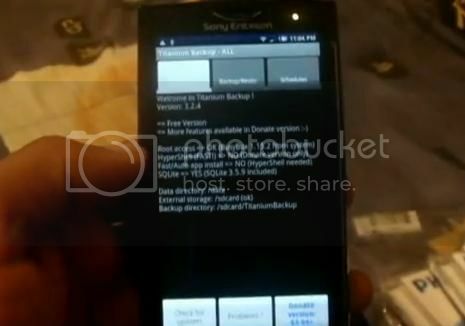 Previous post: Xperia X10 Root instructions released!